All of the most powerful immune boosting ingredients known to mankind have been combined into one revolutionary product - Optimal Defense! As sickness and disease continue to spread throughout the world, health companies have desperately tried to come up with a solution by creating a whole new wave of immune products. Optimal Defense is the first supplement to include the most powerful and effective of these immune-supporting ingredients in one formula. 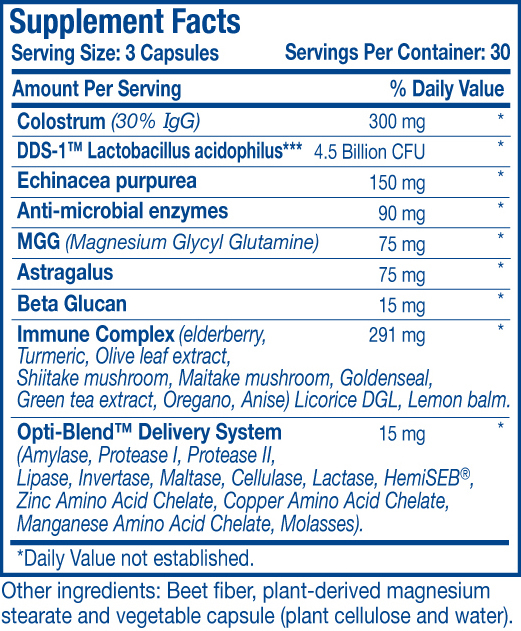 What are the benefits of the patented strain DDS-1 Lactobacillus acidophilus? DDS-1 L. acidophilus is an isolated and cultured strain that is grown and produced under specific conditions to guarantee stability and properties of great significance for improving physiological health and disease conditions. Not all strains of Lactobacillus acidophilus have the same benefits. Research has demonstrated that there exist considerable differences among different strains of L. acidophilus. It has also shown that even the same strain grown under different conditions would demonstrate different properties. What are the "anti-microbial enzymes" derived from? The group of anti-microbial enzymes used in Optimal Defense includes lysozyme, catalase, lactoperoxidase, Peptizyme SP, bromelain, and lactoferrin. These enzymes work together to inhibit and reduce bacterial growth. LYSOZYME attacks the cell wall of certain bacteria making them weak to the point where the bacteria will burst. CATALASE is an immune enhancer and anti-oxidant. LACTOPEROXIDASE is a natural anti-oxidant and increases the body’s immune response. PEPITIZYME SP is one of the most potent anti-inflammatory enzymes and works effectively in controlling infections. LACTOFERRIN binds iron to inhibit bacteria growth and it is bacteriostatic against a wide range of microorganisms. Is Optimal Defense a vegetarian product? No. The combination of immune boosting nutrients includes colostrum, a powerful ingredient that is derived from animal sources. Colostrum is found exclusively in the mother’s milk helping to support the developing body by passing on a nutrient dense "pre-milk" that contains growth factors, immunoglobulins, vitamins, minerals, and many other nutrients. The bovine colostrum used in OHS' Optimal Defense is free from milk production hormone, Bovine Somatotropin (BST) and is totally free from additive substances. It does not contain any antibiotics, pesticides or undesirable residues. This amazing formula also contains the patented Opti-Blend Delivery System to deliver these remarkable ingredients to the body better than they have ever been delivered before. Excellent product. Couldn’t get over a cold so this was recommended to me. As soon as I began taking this, I have felt great. Definitely recommend.